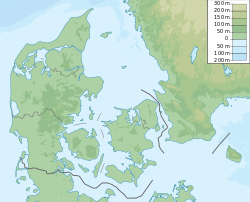 Bjæverskov is a town in Køge Municipality, with a population of 2,917 (1 January 2015) at the road between Køge and Ringsted about 10 kilometres west of Køge and 16 kilometres/10 miles east of Ringsted. In the Middle Ages an estate was located just west of Bjæverskov church. In 1999 Køge Museum made an archeological excavation on the site when Bjæverskovskatten (The Bjæverskov Treasure), a three-legged ore pot containing approx. 2550 coins and some jewelry from about 1254-59, was found.